What is Metal Stamping? Metal stamping involves forming a piece of metal with a dedicated piece of tooling and a press. During the metal stamping operation, the upper die is attached to the ram and the lower die is attached to the stationary bolster. As the press is activated, the ram moves vertically towards the bolster to form the piece of metal over the lower die. Metal stamping presses can perform a diverse range of operations such as blanking, piercing, embossing, extruding, forming and drawing as well as combinations of these processes. TMS has multiple mechanical presses to produce features by piercing holes, extruding, embossing, trimming, marking, ribbing, and many other common stamped features. Utilizing presses with set tooling, you can be sure your part will be made with a high degree of accuracy and repeatability. Capacities range from 60 tons to 400 tons with an in-house tool and die shop so TMS can be a one stop shop for your part. If you need assistance to help optimize your part design for manufacture-ability, please give us a call today for prompt, courteous, professional service. We can assure you the finest quality job in the difficult to form alloys most competitors shy away from. Toledo Metal Spinning Company offers the synergistic ability of being able to combine the necessary metal stamping processes with other in-house capabilities such as metal spinning, deep drawing, welding, and machining to meet your metal forming requirements. 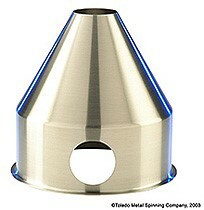 Tooling for metal stamping can be custom made to your part specifications. TMS has over 75 years in metal forming experience and has used the metal stamping technology for a variety of industries such as aerospace, automotive, military, ordnance, plastics, lighting, pharmaceuticals, dairy, etc… We have engineers on staff with metal stamping expertise to help guide you on designing a custom part and choose the optimal process to produce high quality stamped parts at a competitive and affordable price. If you need assistance in designing a custom metal part, please give us a call today for prompt, courteous, professional service. We can assure you the finest quality job for any metal stamping process.